I'm head over heels in love with an online shop -- Emily McCarthy can do no wrong. My new cocktail napkins arrived and the gold foil monogram is stunning. Even more exciting, I've got a giveaway coming your way next week! Emily was so sweet to offer that. 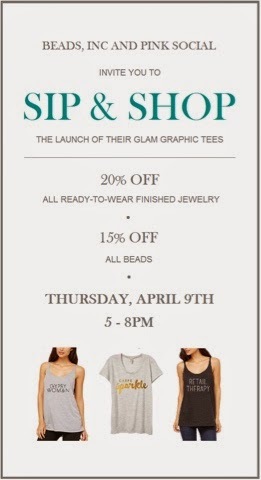 Last night I took Camille to our favorite bead shop here in Charlotte for a fun event showcasing beads, jewelry, and Pink Social tees. I was able to chat with some other fun ladies and the baby put a hurting on their cheese and crackers. I don't follow Weight Watchers but I am a big fan of their program and I like that it accounts for "real life." This recipe for crunchy pear and celery salad from Eating Well looks right up my alley, and it's only 5 WW points. Oh! And it has cubes of cheese in it -- score! I found this free printable calendar from Smart School House, and the thing I love about it is that it is not year-specific. You can print these out, place them behind glass in a frame, and use a dry erase marker to add in the dates. It would be a great family calendar to keep near the coffeemaker with events, vacations, and meal plans. The Masters is on this weekend! Do I care about golf? Heck no! But I like having it on TV and eating dinner outside. Saturday night we have plans to make ribs and a Green Jacket Salad. More to come on this salad later. I love Emily McCarthy! Your napkins are fabulous!! And those calendars are adorable. Thanks for sharing! Happy Friday!! Loving that calendar, April! So cute! :) Hope you have a great weekend! You always have such great finds! Love the napkins and calendar. And I agree, there is something so cathartic about having golf on. Have a great weekend! That calendar is fantastic!! Thanks for posting it. Have a great weekend. That calendar is too cute! Must print that out! I'm right there with you on having the masters on in the background......kick off to summer! 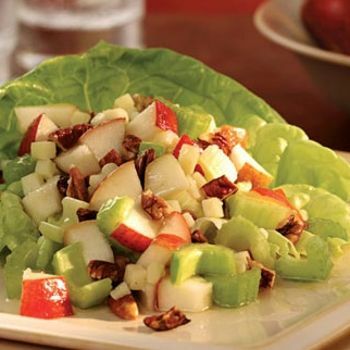 That pear and celery salad looks so good and perfect for warm weather meals. Love those napkins and that salad looks so good! I just pinned the recipe! I love those calendars! I might even print them for work, and use them at my desk! oh Ribs and that salad with golf in the background sounds perfect! Especially the eating outside. And those printables are totally perfect! Those napkins are adorable! And LOVE the calender printables! have a great wknd, friend! The salad looks so so good! Can't wait for the giveaway! The printable calendars are beautiful. I've eyed PaperSource ones forever but never bought (intended to once but they were sold out). Love this customizable ones instead.